“In our family of wines we have two whites, five reds and one sweet wine. Technical Director Marañones Winery* Transcript of interviews for the presentation of our wine. “Picarana is our white Pueblo or Comarca wine. 100 percent Albillo Real local grape. There is very little Albillo Real left in Spain. It is mostly located in Gredos and in the hottest villages, because the Albillo Real likes the sun a lot. It is a very early grape, usually for the table, very tasty, very juicy. It has a very small bunch that turns golden immediately. It allows us to obtain a white wine with a lot of density in the mouth and unctuousness, due to its high content of glycerin. The name of picarana was given as a tribute to a bird in the area, even though we are literally at war with them, because they eat the grapes. The name serves a little to reflect that union of land, environment and wildlife. Although we have to dispel the birds so that they do not do too much damage, we paid them a tribute by giving their name to the wine. “The first of our red wines would be 30,000 maravedíes, which is our Comarca wine, a regional wine, village wine. 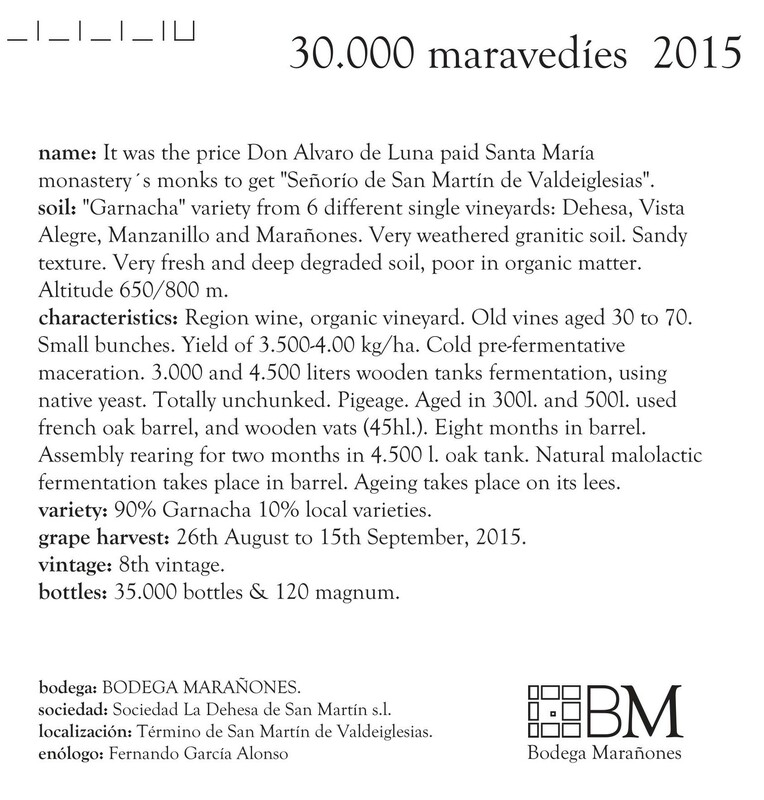 30,000 maravedíes is the coming together of all soils, orientations, dominantly Garnacha at 90 percent with a remaining 10 percent of local grapes. The minority grapes close the composition. The name also reflects the union between history, the winery, the structure and the place. Álvaro de Luna paid 30,000 maravedíes to buy the whole region from the monks who fostered the cultivation of the vine. It is a historical name. It refers to what was paid for the Valley and pays homage to the Valley. It also evokes what the monks had developed. This history is part of our heritage and we continue it. “Piesdescalzos, is an Albillo Real Parcela wine from a single small vineyard, less than one hectare. It has the peculiarity of being located in a place called Peña Cruzada. It is on the high side of the crag, receiving sun all day, which suits Albillo very well. Pink granite, with very little soil. The soil of which the vineyard lives is only 30 to 50 centimetres deep. Underneath there is a much more compact stone. It reduces the fruity sensation in the wine and increases the mineral notes. 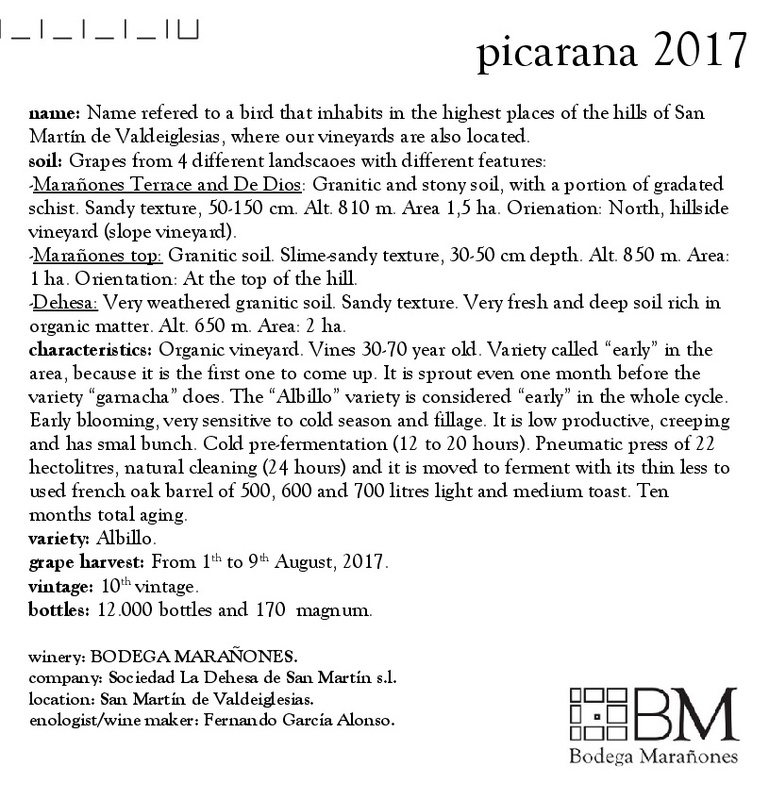 “Marañones is so to say our signature vine. This is why the winery was named after this location. It is part of the mountain at 800 m in altitude, oriented North. We find there the three types of granite of San Martin: the white granite, the brown and the pink. 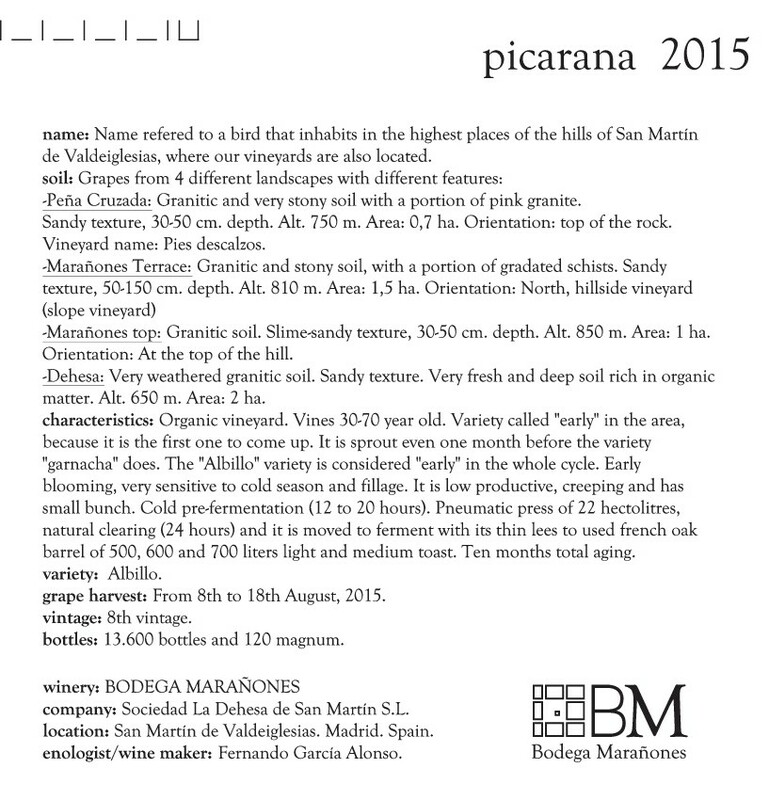 Each vineyard at Marañones has a different soil. Some are on a hill. Others are more towards the plains. In this wine we wish to convey the Marañones area so representative of the whole winery. this is why we make this wine from the great Garnacha grape. We use a mix of vines since it is not a Parcela wine, which would be much more delicate and of more limited production. “It is one of our Parcela wines, of 100 percent Garnacha. We want to convey in it the area of “La Dehesa”, which is the bottom of the Valley of San Martín de Valdeiglesias, where we have an alluvial soil with a lot of depth for the roots. Labros is just a very old vine, more than 90 years old. It is located on a small hill, facing west, of a very compact white granite that stresses the vine. Being so old it is very unproductive with very low yields. It is a plot of about one hectare where we roughly produce 2,000 – 2,500 bottles. It is the reflection of the most Mediterranean vineyard we have. This means that the fruit is always above the floral sensation, with a slightly rougher tannicity, due to the type of soil. Above all, it is a very deep but non-linear wine. It is similar to other wines from the same range, but more compact, with a longer finish. “Another Parcela wine, 100 percent Garnacha, it is really our forerunner wine. “This wine is named after Fernando Cornejo’s younger grandson as a tribute. To us it represents the opposite of Garnacha. It is a minority grape without Garnacha. “Another tribute wine named after the other grandson of Fernando Cornejo. We use Moscatel de Grano Menudo, a local grape. Like in many other viticultural areas, other types of grapes are also planted within the vineyard. Inside the Albillo vines, we also grow Moscatel varieties to make sweet wine. The grapes are left to dry and condense on site.The beauty of the Moscatel is that within the structured, sweet part, it maintains a lot of acidity. This makes it a very drinkable wine that also has a great potential for ageing. Beltrán is a very limited production, a total of 300 small bottles, and depends a lot on the vintage. In the worst years that are drier, we reach 100-150 bottles. 70 percent of our production is exported. We are pleased to have consolidated our presence in the most important countries of quality wine consumers. The growth of our production is gradual and steady. We are very conscientious in the choice and cultivation of the vines before incorporating new grapes into our wine. Both in the vineyards that are our property (19 hectares) and in those that we rent ( 6 hectares). We will maintain sustainable growth but stay true to the quality of the processes.